Most of the time I believe myself to be a pretty savvy dog musher. After all, I first stepped onto the runners of a sled 27 years ago, so surely I had to have learned a thing or two along the journey. Usually I can figure out dog behavior and adjust how I work with each canine accordingly. I get to where I not only consider myself the leader, I stupidly think I am the best these dogs have ever seen. And then our dogs have a meeting and one is chosen to cook up some humble pie and serve it to me – without ice cream. Tonight that dog was Jake. He was born into our kennel seven years ago – the son of Diablo and Mobad. By all rights he should have been a stellar lead dog because both his parents were and typically leaders breed leaders. Not Jake though. Nope. He was an odd little duck from the beginning. A bit aloof from his siblings. I had actually wondered if he was deaf but time soon showed me he wasn’t. He was just Jake. Now let me digress for a moment. In a dog team there are the leaders, the dogs up front. They are pretty intelligent and confident and not only know commands but are bold enough to hold a team out straight and lead them where the musher wants to go. The two dogs behind the leaders are swing dogs. Their job is to help the leaders. They may be in training to take the helm or they may be dogs who just don’t have the confidence to lead, but understand the commands. The two dogs closest to the sled are wheel dogs. They are typically the biggest and while most mushers don’t give them a lot of credit they have a very important job. 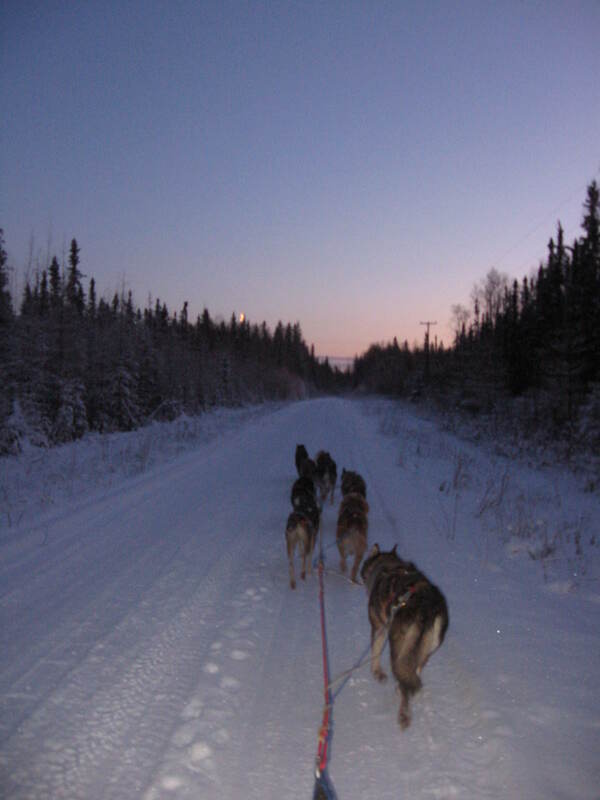 They bear the brunt of whatever is happening with the sled and good wheel dogs will run a bit wider around obstacles like trees, so that the musher doesn’t end up busting the sled. The dogs in between the swing dogs and wheel dogs are called team dogs. They are happy grunts who just like to work and run. They have no aspirations to be leaders and they don’t want the job to keep the musher from crashing into trees and such. They just want to pull a sled and eat up miles on the trail. No thinking. No responsibilities. Just run. Now back to Jake….Running him proved to be a bit of a challenge. About two miles from our yard we cross a bridge that is safe by backwoods Alaska standards. Jake ran across it time and again until one day he just “pancaked” – dropped to the ground with all four limbs spread out. At first he would do this just before the bridge but pretty soon it got to be about a 1/4 mile from the crossing. Jake is third up on the right. The team is running nicely…for about another half mile. I don’t believe in dragging dogs across scary things. I like to bring the dog to what scares them most and have them just stand there with me by their side. Pretty soon, like horses, they learn that their human will not let them come to harm and obstacles are no big deal. Well, Jake was never fully convinced, but he decided that in order to have some fun he’d have to cross the dreaded bridge. We’d march across at a snail’s pace and he would explode into a run on the other side every single time. This past summer Jake began to develop a penchant for eating his dog house bit by bit. We had rain and then rain and then rain so I figured he was stressed. Other chewy things didn’t interest him a bit. 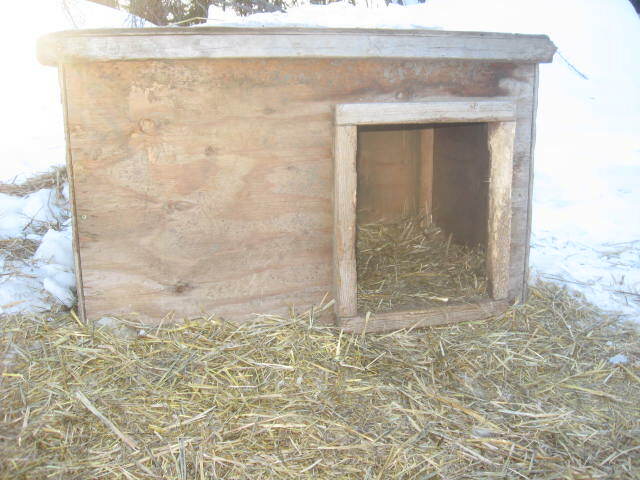 Dog houses aren’t cheap to build around here – especially in the summer when lumber prices almost double because it’s building season. He went through three in very short order…..nibble, nibble, nibble. Little piles of sawdust. Here is what a house should look like. 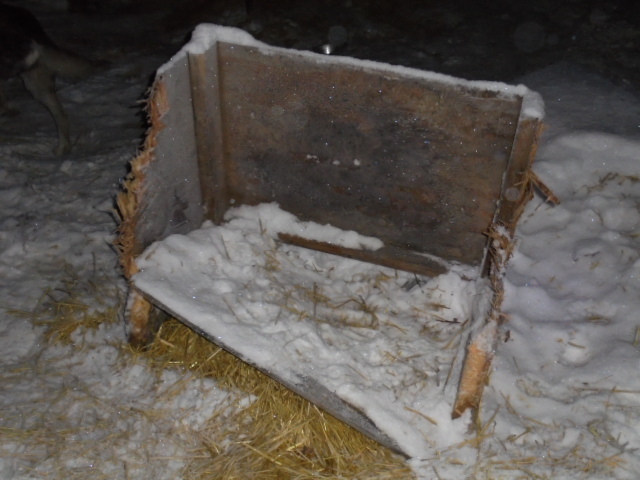 Lots of straw…..apparently inside and out. We like to give our crew lots of straw. Some dogs keep it neatly inside. Some not so much. In the fall Jake slowed down a bit but still destroyed two. I wasn’t sure what I was going to do. And then we had to move Bigley up to the house because he was sick and needed medication and monitoring. I decided to move Jake to Bigley’s area and prayed he wouldn’t eat the house. Now this location has several small spruce trees in it and guess what? Jake is happily gnawing down these little trees and isn’t interested in the dog house at all! Thanks Jake for reminding me that most times I am a team dog and you all just amuse me and let me thing I am the leader!